Monks and residents from Hpa-an protest against the destruction of the town’s historic football ground to make way for the construction of a hotel and shopping mall. As many as 500 monks gathered on Friday, September 27, at the Hpa-an Maebaung Monastery to demonstrated against the building of the hotel and shopping mall on Myoma Football ground. The Myoma football ground had secretly been sold to businesspeople by local authorities without the public being informed. The construction of the hotel and shopping mall on Myoma football ground is being carried out by the local business, the Mya Htay Kwye Linn Co. Ltd.
Sayadaw Ashin Sandar Waya said that only when the monks gathered together with the town’s residents and got ready to march that U Sai Chit Hlaing, the Karen State Social Affair Minister and Hpa-an District administrators wanted to negotiate between the construction company, monks and Hpa-an residents. Sayadaw Ashin Sandar Waya said. The agreement struck between the authorities and the monks, states that there will be a tripartite discussion between Hpa-an residents, monks and government authorities in order to stop the construction works on the Myoma football field. Ko Aung Myo Thet, a young resident from Hpa-an said that if the company wanted to develop hotels, they can do it in other places, but not at the historic Myoma football ground. Speaking to Karen News, Ko Aung Myo Thet said. The town residents and monks learned strongly opposed the building of a hotel and shopping mall on the football ground, as it is a designated public space. 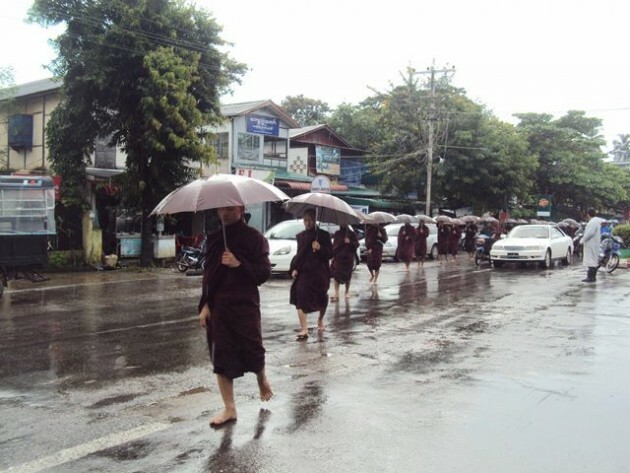 The Hpa-an residents and monks began their protest campaign against the construction in August 2013. The Myoma football ground is better known as the historic symbolic site where General Aung San delivered a speech on ethnic unity over sixty years ago and is now used for national celebrations. The Union Ministry of Hotels and Tourism gave permission to Mya Htay Kwye Linn Co. Ltd to build a hotel and shopping mall on the football ground on June 28, 2013. The company began its construction works in July and said it expected the project would take one year that is until the recent protests halted work.